This utility generates a special popup calendar in Microsoft® Access® to pick and count dates, may insert dates and date ranges (Date Picker) in Access. 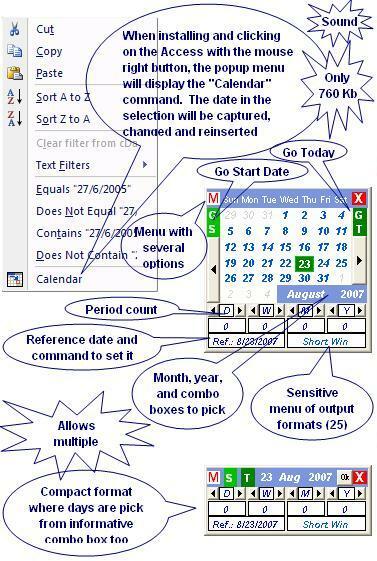 It is programmed in Microsoft Visual Basic® for Application (VBA) and optionally available as COM Add-in (dll), EXE Add-in (mda/exe), or Access Add-in (mda), may be useful for Access interface user and VBA programmers. See the pictures below. It consists basically of only one file (AccessCalendar.dll, AccessCalendar.exe, or AccessCalendar.mda) that can be installed automatically using one of the installer package files available below to download. Except for the DLL, if you choose COM Add-in, no other setting is saved in the Microsoft Windows® Register. Its setting is saved in AccessCalendar.ini and AccessCalendarLoadExe.mda files that are created and maintained by the proper utility. You also can uninstall it automatically, leaving no mess on your Windows Register or disc. Tested in Access for Windows, versions 2000, 2002(XP), 2003, 2007, 2010 (32 and 64-bit), 2013 (32 and 64-bit), and 2016 (32 and 64-bit) in MSI-based and Click-To-Run installations of Office 365™ cloud-based services. Note: The above link downloads the installer and uninstaller package programmed in VBA in a MDB duly converted to EXE by the DBtoEXE to make the installation easier for macro and Windows laymen; however, if you're an expert and for some reason prefer an installer and uninstaller package in open ZIP format, click here. With this zip package you can install it in three ways: (1) Simply initiate the Install.exe that loads the same MDB in Access without macro alert; (2) Extract the entire package to a folder and initiate the MDB, enabling the macros in Access and using 123 as password, or (3) Install the DLL manually. See also for Microsoft Excel®, for Microsoft PowerPoint®, and for Microsoft Word. 7 - TopPos (String, Default="0"). Where LeftPos and TopPos are the distances in points (1/72 inches) from the center right side of the calendar to the current mouse position. If the values are preceded by $ (dollar sign), LeftPos and TopPos turn to be the distances from left top corner of the calendar to the left top fix corner of the screen. And yet, if there is only the $ without number, will be used the current default position.
' variant (Date) to a userform.
' any of the output formats like in the right click command. '3 - Idem to capture and return date to active selection. Const AddInTitle As String = "Orlando's " & "AccessCalendar"